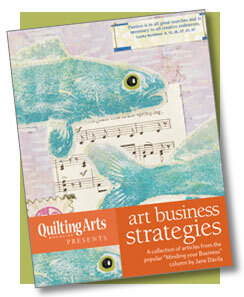 and I am thrilled that my article about How to Objectively Price Your Art Quilts is included, as a bonus article! Click here for details on downloading the eBook for only $9.95. The article was a collaboration with a group of fabulous artists from 2006 in Quilting Arts Magazine. I had the honor to work with Pamela Allen, Anne Copeland, Peg Keeney, Holly Knott, Jeri Riggs and Michelle Verbeeck. That sounds like a good book for a lot of crafters. Pricing is always the hardest thing to do. I haven't sold this year, taking a break and working on my health, but I see so many people selling things so low on ebay, it is sad to see them create such beautiful things and not get bids.